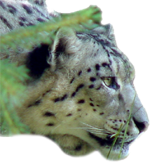 One project that Exbiblio has helped fund does some very good work using well-thought-out levers designed to help both snow leopards and the local human population. They could really use some publicity in the context of the forthcoming OS X release. A wonderful sense of life. I saw the HP TouchSmart yesterday and tried it out very briefly. As with Windows CE, I got an immediate sense that there's a huge mismatch between the I/O device and the UI, i.e., that a much better UI could be made given the possibilities of the input and output capabilities of the hardware. I don't know whether the screen supports multi-touch (sensing multiple fingers at the same time), but, I didn't have time to ponder where in a Windows UI I might find something to test on. Still, you can passably tap buttons, except even there, I tried to hit the close 'X' button at the top right corner of the screen, and, well, I couldn't. The bezel around the screen juts out at a 90 degree angle 1 or 2 millimeters beyond the last pixel, and it's a massive 1/2" or so high, so fingers can't go there. Back to the drawing board. Still, HP makes some wonderful video ads. PolarisMotor in Italy has some very fun-looking vehicles. Thanks to Q for the link. Save up to 80% on Ray Ban Sunglasses Today!